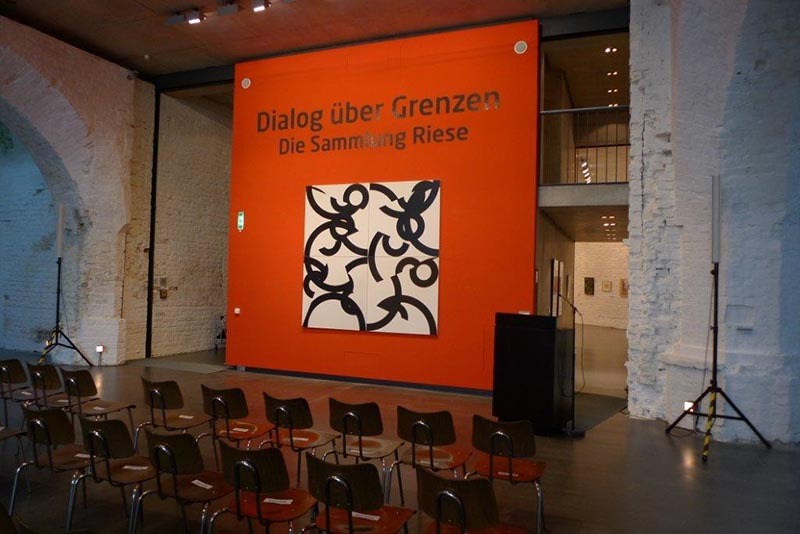 Maria Kuba's report from the exhibition “Dialogue across the border”, presenting Hans-Peter Riese's collection in GASK in Kutná Hora. The Central Bohemian Gallery in Kutná Hora presented a collection of German journalist and art critic Hans-Peter Riese, who compiled a collection of artworks from the 60s during his stays in Germany, Czechoslovakia, the Soviet Union and the United States, creating a link between the artist during the time when their mutual cooperation was almost impossible due to the Iron Curtain. Therefore the name “Dialog across the border” was appropriately used for this show. Hans-Peter Riese came to Czechoslovakia as a journalist in 1963. As his activities were soon noticed by the secret police, he was labeled a “Ryšavec” (shelf fungi), and his contacts with contemporary artists were carefully monitored. “All the time I met with artists, and I was fascinated by the fact how good the art was here” says Riese. His activities were cut off in 1973, when he was eventually deported. 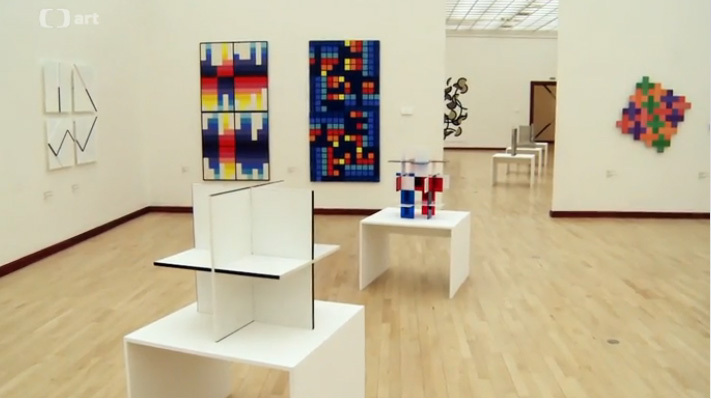 Part of his collection focused on artists from the former Czechoslovakia is one of the most comprehensive collections of Czechoslovak Fine Arts from the 60s and 70s shown abroad. With this collection GASK would like to present at least the partial deficit that exists in the minds of Czech art, especially from the 60s and 70s in Germany and vice versa. “We think that shows with a similar focus are still missing in both countries”, says the gallery. Riese's collection contains such names of Czech and Slovak artists as Jiří Kolář, Zdeněk Sýkora, Karel Malich, Jan Kubíček and Milan Dobeš—poised beside such world-famous names as El Lissitzky, Richard Paul Lohse, Günther Uecker and Andy Warhol. “Collecting was nothing deliberate, but eventually it became a lifelong hobby,” says Riese, who has worked for over forty years as an art critic for the Frankfurter Allgemeine Zeitung. He also worked as a political reporter and foreign correspondent in Prague, Moscow and Washington, and lived in many other countries. In all of these countries he would complement his collection. The Central Bohemian Gallery in Kutná Hora GASK is displaying an art collection by German journalist Hans-Peter Riese from June to September . The man who since the 60s has popularized Czech art in the German media and contributed to the publication of Charter 77 in the world press. Riese celebrates this year his 70th birthday. Since 1968 he has contributed to the German daily Frankfurter Zeitung Algemeine, and during the years 1969 to 1973 he also wrote for other media, e.g., German radio. Riese's collection bears the distinctive title “Dialogue across the border” reflecting the culture of regions where he was actively moving for over forty years of his journalistic career. During that time he befriended many Czech artists and spread awareness about them in the West. “I came to Prague for the first time in 1963. German artist Reinhold Köhler wanted to organize an exhibition together with Czech artists,” Riese described the beginnings of these bonds for the Czech Radio. A respected art historian Zdenek Felix who worked as a redactor in a magazine Výtvarná práce was Riese's guide in Prague, and he led him into the most important studios in the city. During this time Riese's art collection grew by 300 paintings, sculptures and graphic works. Gradually, Riese, a graduate in political science, history and sociology, wrote several books on Constructivis art in Central and Eastern Europe. He has won several awards for his work, including Fritz Sänger price for his commited journalism. The artists he promoted in Czechoslovakia were, for example, Jan Kubíček, Zdeněk Sýkora, and later also the world famous Jiří Kolář. Contacts were especially strengthened after 1964, when Riese began to work as a radio reporter in Prague. “All this led to my deportation from Czechoslovakia in 1973,” says Riese. He then carried on at least with publishing works by Czechoslovakian artists in Germany, and continued organizing cultural events at the University of Frankfurt, one of them being the exhibition Constructivist Tendencies in Czechoslovakia. Riese connected Czech and German artists with his artist friends in Cologne, Frankfurt and other cities. He was deported from Prague on September 11, 1973. By that point he had already worked for a decade on the systematic popularization of Czechoslovakian art in the German media. “The art scene works so that when you are not seen you will be gradually forgotten,” explains Hans-Peter Riese. One of his artist friends, Zdeněk Sýkora was represented by a Western Gallery. Jiří Kolář supported local art from Paris, but Hans-Peter Riese is remembering all the troubles what his friends had in the 70s Czechoslovakia: “The great artists such as Kratina, Boudník or Kubíček ceased to be perceived in the West, owing to normalization”, says Riese. In 1985 Riese went to Russia and worked as a correspondent in Moscow. But that's when everything was warming up with Gorbachev's perestroika. German galleries were again interested in Czechoslovakian art. Their most important partners were then for example the Teufel Gallery in Cologne, which represented Sýkora, Malich and Kubíček. Hans-Peter Riese as a journalist in Bonn pushed through the idea that the world press should learn about the Charter 77. He had the confidence of its signatories, and they asked him to arrange a publication of the text in the most important Western European newspapers. He invited fellow-journalists to his home, and due to this on 7th January 1977 text of the Charter 77 was published simultaneously in the New York Times, Corriere de la Serra, Frankfurter Allgemeine Zeitung and others. After a long period of indifference and silence, thanks to the Charter 77 the world was awakened and interest in Prague and Czechoslovakia arose again. Czech artists today have to compete in the world art market without having their cards of being dissidents. From the perspective of Riese, they are able to manage. “I was recently in New York where I passed one gallery, and in its window, to my great surprise, was a sculpture by Karel Malich, which made me happy”, says Riese. With regret, he is adding that many of his artistic friends didn't get any recognition until they were in their seventies or eighties due to the pressure of the communist regime. 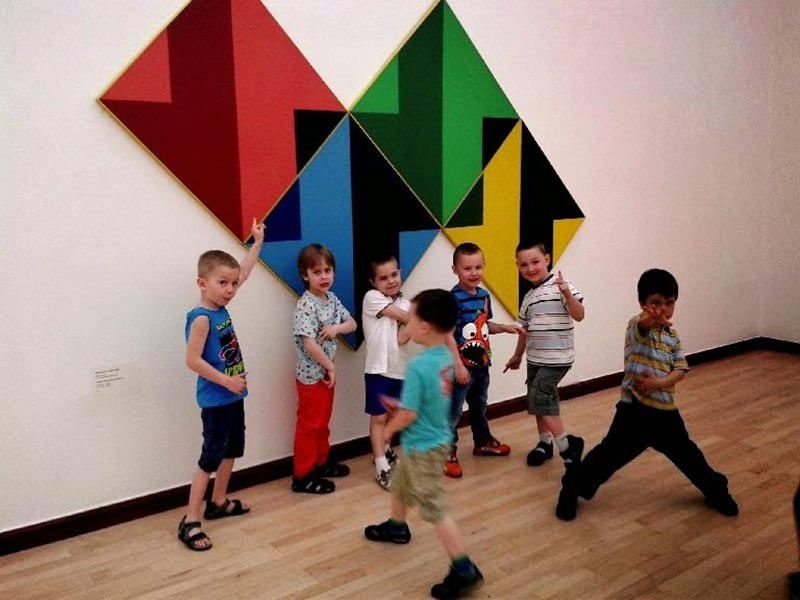 Daniela Frumarová gives guided tours of paintings at the retrospective exhibition in the City Gallery. Artmix – ČT Art: The most significant events of the upcoming summer season..
Galerie Kuzebauch in Prague offered a selection of interesting objects from the work of Jan Kubíček as a little taster before his large retrospective exhibition, which was scheduled for mid-April at the City Gallery in Prague. Kubíček's objects were on view in a solo exhibition for the first time in history. 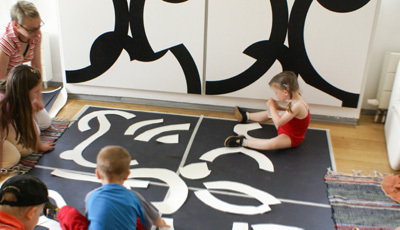 Abstract black and white work of Jan Kubíček was the base for an image of a giant puzzle, which became an enormous collective work.